There are approximately sixty species in the genus Stanhopea, all native to central America from Mexico south to Ecuador, Colombia and Venezuela. They are mainly found growing on steep mountain sides, trees and rocks but there are also a few terrestrial species. 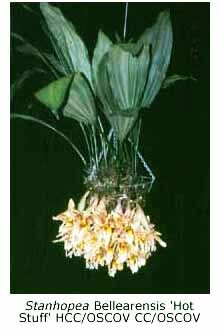 Although some of these species grow near sea level, others are found at altitudes up to 5000 m, so by no means are they all warm growers and some thrive in Melbourne in conditions suited ideally for cymbidiums. My stanhopeas grow in baskets lined with paperbark and are suspended about 500 mm below the shade cloth roof (50% shade factor) of my cymbidium house during both summer and winter. Stanhopeas grown in shadehouses generally flower in summer or autumn. Usually the first flower ‘spears’ (flower spikes) emerge from beneath the basket in late spring and take about two months to develop fully. 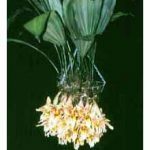 Flowering is spectacular – the flower ‘spears’ emerge from the base of the mature pseudobulbs, pierce the liner of the basket and eventually the buds burst open (sometimes with an audible pop) in early morning. A heavy, sweet fragrance is immediately released. The flowers last for only three days, which in nature gives the pollinator (a bee) little time to have his wicked way. The grower faces the same time constraint to show his plant at an orchid meeting! Transporting your plant to a meeting is not difficult, although it requires some ingenuity. Select a deep box or bucket which is a little wider than your basket and thrust two stakes horizontally through it just below the rim. These stakes will support the basket so that the inflorescence will dangle safely within the box or bucket. Some fore-thought is also necessary as to how your exhibit will be displayed – either on your own stand or by propping the basket on its side on the bench. The genus Stanhopea was founded on S. insignis when that flamboyant orchid flowered at Kew Gardens in 1828-1829, and there are about sixty other species. Natural hybrids are rare because, although different Stanhopea species may flower side by side, each has its own perfume which attracts a different species of bee. Also the precise dimensions of the fertilisation path that the bee follows down the lip limits the size of the bee and the pollen mass that the bee can carry away. Some stanhopea species are quite variable in colour and markings. The species most commonly benched in Melbourne are S. nigroviolacea, S. tigrina and S. wardii. The flowers of S. tigrina are larger and the tiger stripes are made up of an aggregation of red spots. The red spots on the flowers of S. nigroviolacea are randomly distributed on the tepals and the base of these cream-coloured segments is covered by an intense “bull’s-blood” red. S. wardii has 5-10 medium-sized, golden flowers covered with fine red spots with a conspicuous eye spot at the base of the lip. More important than flower count, size or colour, the shape of the lip is the main basis on which taxonomists separate the Stanhopea species. The lip is considered in three obvious sections – the hypochile (the bulky perfumed part at the top where the lip meets the base of the column), the mesochile (the short middle section which carries the horns) and the epichile (the piece at the end, which is more or less heart-shaped). The hypochile is the source of the perfume which attracts the pollinator, a particular species of bee. Having invaded the hypochile, drunk the nectar and over-indulged, the bee slides down the chute formed by the horns of the mesochile to the epichile, in the process having the pollinia attached to its metathorax by a sticky glue. This article draws on an excellent book, Those Astonishing Stanhopeas, published in 1998 by Barney Greer, who resides in Sydney and who is internationally recognised as an authority on the genus Stanhopea.